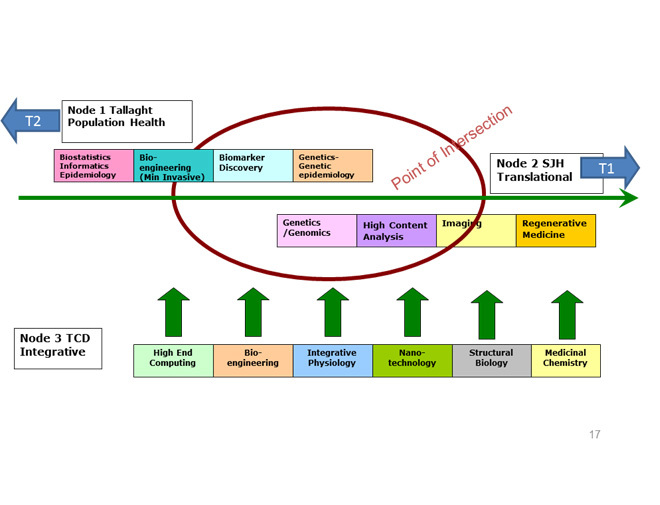 Developments of integration pathways between academic programmes and clinical programmes. Important in this area is the proposal to establish a Women's Health Research Institute at the Coombe Women and Infant's University Hospital. Creation of structure for academic leadership programme / "Leadership Academy"
The research strategy is super-imposed on the TCD's research strategy and currently can be illustrated as in Diagram 2. Node 1: TCD Discovery science and integrating technologies: incorporating pathway analysis, structural biology, medicinal chemistry and integrated biology and bio-engineering to be developed at TCD main campus. Node 2: The Translational 1 Domain: Translational research incorporating genomics, genetics, regenerative medicine and advanced imaging incorporating nanotechnology to be based on the St. James’s Hospital site. Node 3: The Translational 2 Domain: Population Health encompassing disciplines of biostatistics, epidemiology, population based research, genetic epidemiology and genetics to be based at the Tallaght site. Bioengineering is included at the Tallaght site. 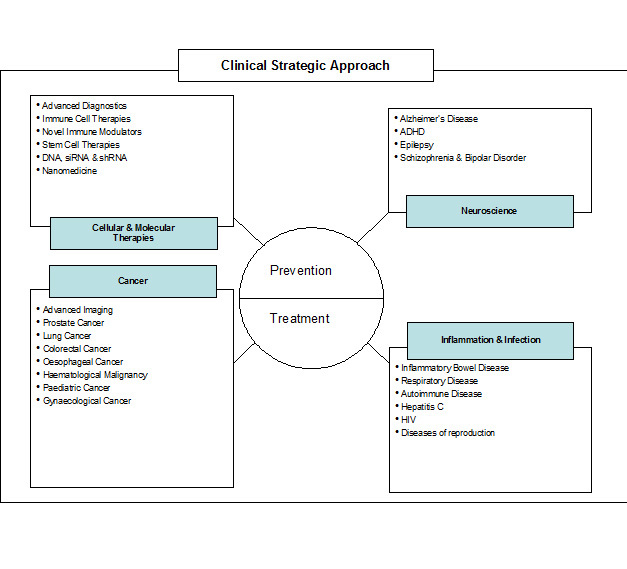 The major themes of cancer, neuroscience, immunology and genetics will be cross-cutting themes across all of these three nodes. In addition enabling technologies such as nanotechnology, imaging and genomic technologies should be in place across all the three nodes.